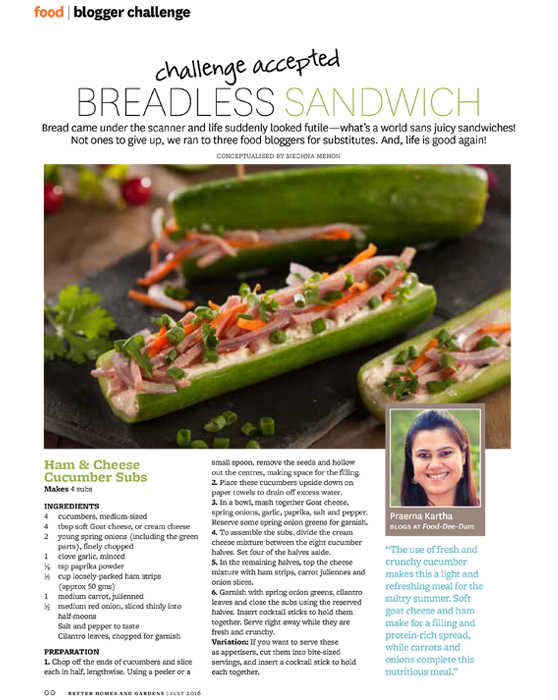 Challenge Accepted: Better Homes & Gardens India Challenged me to contribute a “Breadless Sandwich” Recipe for their July 2016 Issue. 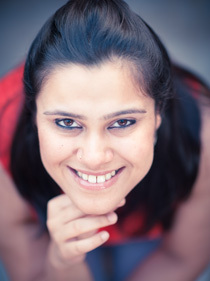 A few weeks ago, Better Homes & Gardens India got in touch with me to participate in a Blogger Challenge. As some of you may know, commercially produced bread in India has recently come under the scanner and everyone seems to be worried about the carcinogenic hullaballoo. The loss of faith in bread seems to be a real thing and I can’t even imagine not having a sandwich a few times a week as part of my regular diet. So BHG challenged me and 2 other talented Indian bloggers to come up with “breadless sandwich” recipes – they wanted them to be flour/maida/atta-free and yet be filling, nutritious and not leave the readers feeling cheated. For my part of the challenge, I chose to make Ham & Cheese Cucumber Subs. 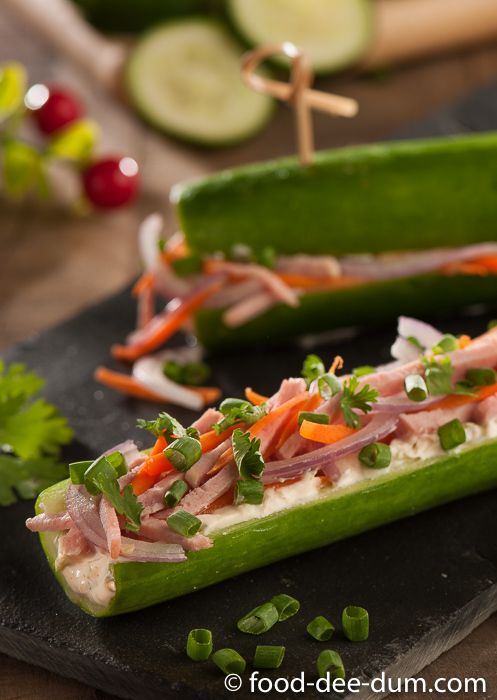 Cucumber Subs are a great way to up your “breadless sandwich” game. Fresh, crunchy cucumber halves form the base of this sub, making it a cool, light and refreshing meal in the sultry Delhi summer. Add on some soft goat cheese and ham for a filling and protein-rich spread topped with crunchy salad like carrots and onions to make this a satisfying and nutritious meal. Easy and quick to make, these subs work beautifully as a meal for 2 or even as appetizers for 4. 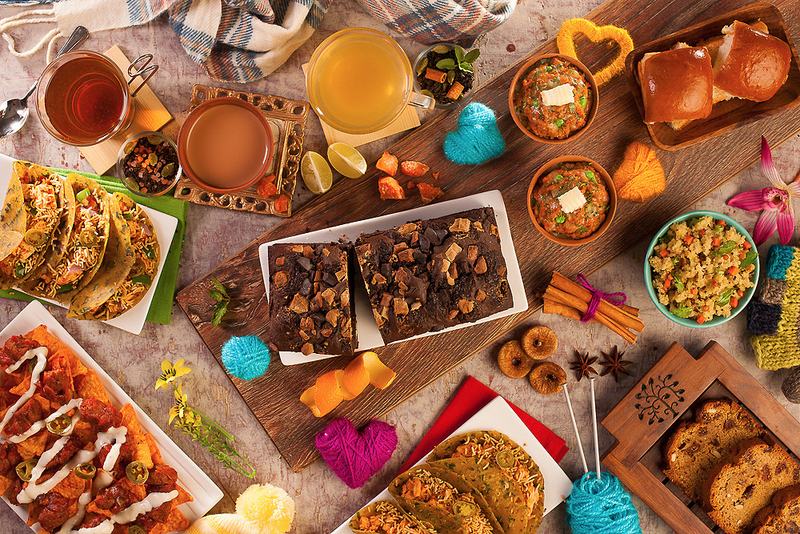 Or, alternatively, make them in smaller portion sizes for pretty party snacks! BHG published the story in their July 2016 issue, and I’m so excited to be featured alongside the very talented Neha Mathur and Kirthana Dorairaj. If you haven’t grabbed your copy of the issue, please do so today! 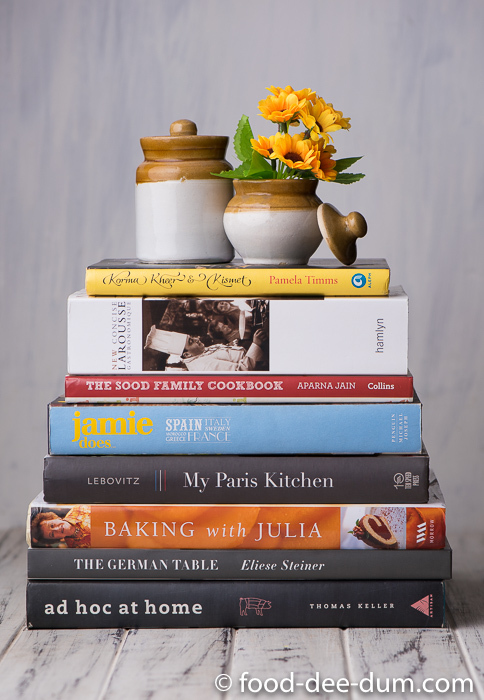 For everyone else, you can check out the detailed recipe below! 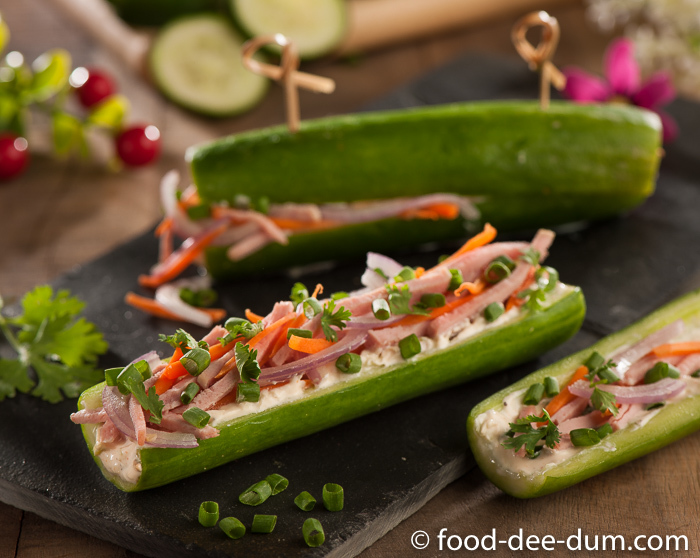 Cucumber Subs are a great way to up your “breadless sandwich” game. Easy and quick to make, these subs work beautifully as a meal for 2 or even as appetizers for 4. Chop off the ends of the cucumbers and slice in half lengthwise. Using a peeler or a small spoon, remove the seeds and hollow out the centres making place for a filling. Place these upside down on paper towels to drain off excess water. To assemble the subs, divide the cream cheese mixture amidst the 8 cucumber halves. Set 4 of the halves aside to be the top of the subs. In the remaining 4 halves, top the cheese mixture with the ham strips, carrot juliennes and onion slices. Garnish with the spring onion greens, cilantro leaves and close off the subs using the 4 reserved top halves. Use cocktail sticks to hold them together. Serve right away while they are fresh and crunchy. Variation: In case you want to serve these as appetizers, you can cut them into smaller bite sized servings with a cocktail stick holding each together. Or you can cut the cucumber into smaller pieces & hollow out the centre like kulliya.